I had the pleasure of curating an installation for the University of Michigan Hospital. My artist group Fiber Artists @ Loose Ends were given images by artist Liz Quisgard and asked to make 40"x40" quilts as a riff on her style. Here you can see all the pieces created by my friends. I am very pleased to unveil a special project I had the privilege of supporting. 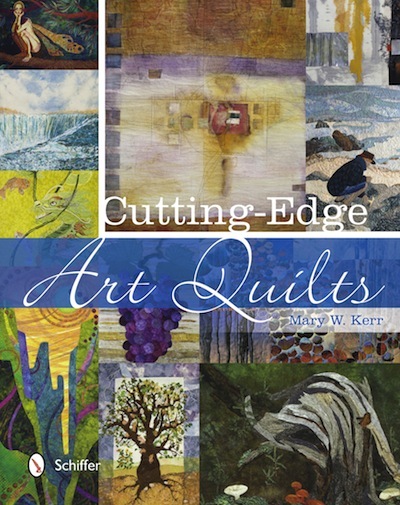 It's a new book documenting the 50 year history of the Art Quilt. 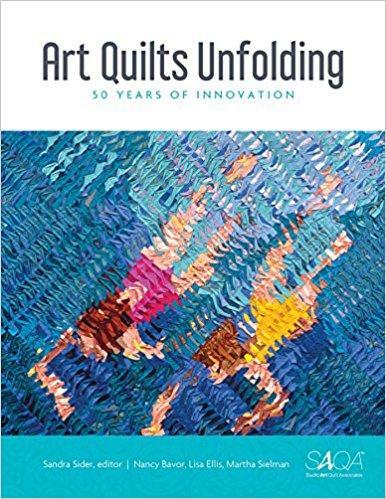 From 1965 through today, the art quilt movement has grown to become one of the most exciting art forms of the 21st century. Today, thousands of artists and collectors around the world are passionate about this art form. Until now, there has not been a comprehensive, chronological history of the studio art quilt, which has become an international phenomenon. Published by Schiffer Books, this publication offers full-color images of 400 masterpieces along with engaging interviews and profiles of 58 influential artists, key leaders, important events, and significant collections. Organized by decade, an additional 182 international artists' works are featured. An introduction by Janet Koplos, former senior editor of Art in America, and a conclusion by Ulysses Grant Dietz, emeritus chief curator of the Newark Museum, help us to understand the impact and the future of the art. 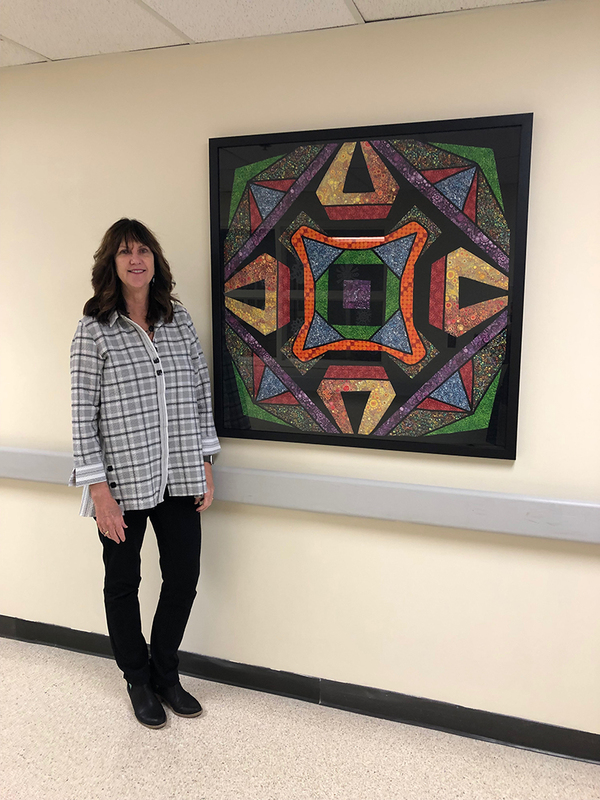 Since 1989, SAQA has been working diligently to raise awareness and appreciation of the art quilt and the artists who make them. 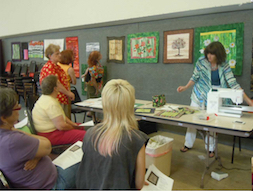 A key aspect of SAQA’s overall mission is to document and record the progress of the art quilt movement. With the generous support of our donors, the Art Quilt Retrospective project now includes this beautiful publication and two traveling exhibitions. The companion exhibition - Layered & Stitched: 50 Years of Innovative Art - will premiere at Quilt Festival Houston in 2019. To purchase through the SAQA store: Click HERE. 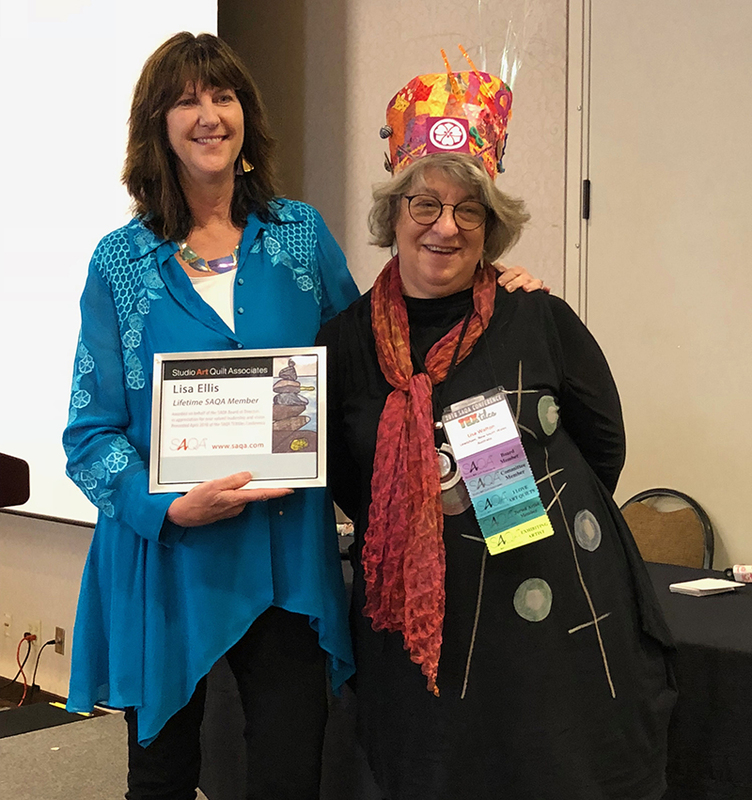 On April 8, 2018, I passed the SAQA President Crown to Lisa Walton. She is our first SAQA President to reside outside the US. She hails from Australia. 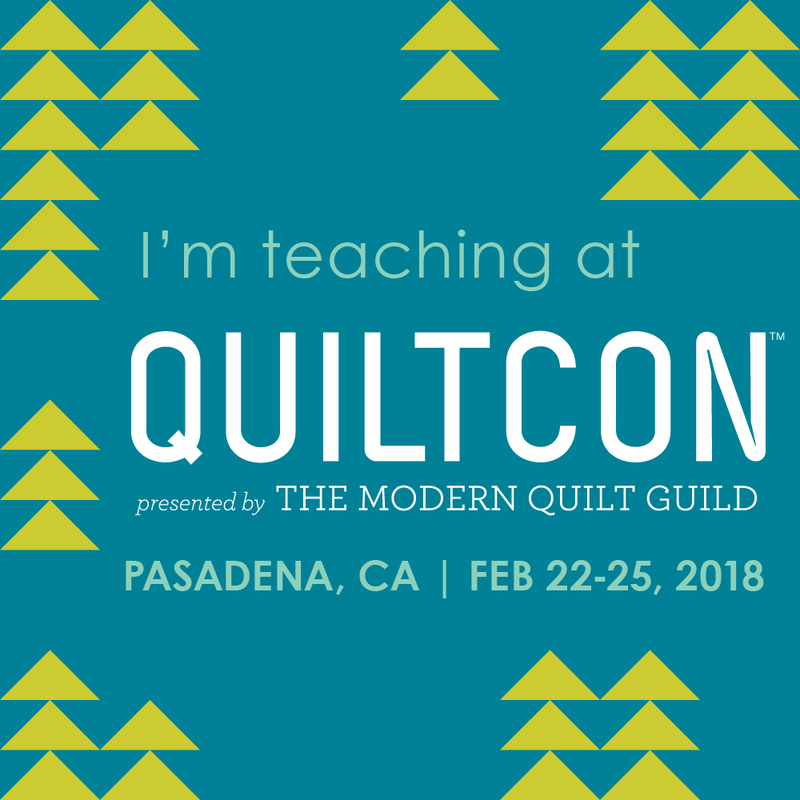 I taught at QuiltCon 2018 in Pasadena. It was a blast to present the SAQA exhibit Modern Inspirations. We presented SAQA's	lecture on Modern Inspirations (with colleague Nancy Bavor) and a Gallery Walk of the Special Exhibits. 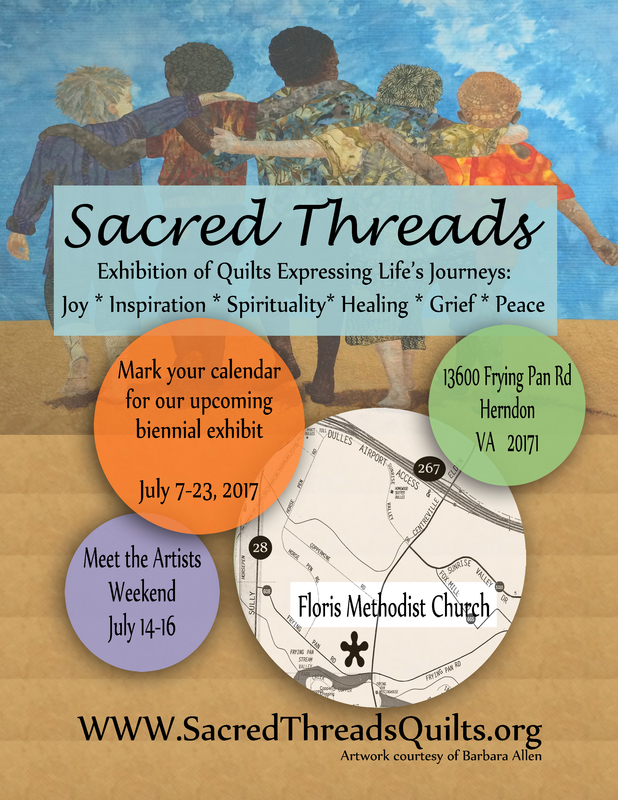 Sacred Threads 2017 is now over. It was another rendition of an poignant and beautiful exhibit. Our 2019 exhibit plans are well underway. Plan to come and enter. July 11-28, 2019 at Floris United Methodist Church in Herndon, VA. The call for entry is October 1, 2018 - January 10, 2019. Fiber Artists @ loose ends has added to the windchime installation with 10 additional pieces representing the seasons. The ten members of Fiber Artists@loose ends created this 4 part installation featuring the four elements of Fire, Water, Air and Earth. Within the parameters set by the group the 4 pieces rotate on their own and reflect each artists own unique style and individuality. We are always looking to challenge ourselves to create art and explore new ideas and techniques and show our passion for the medium. On April 3, 2016, I became the new President of Studio Art Quilt Associates. Pictured to my right is Kris Sazaki, the outgoing president who served the organization well for three plus years. 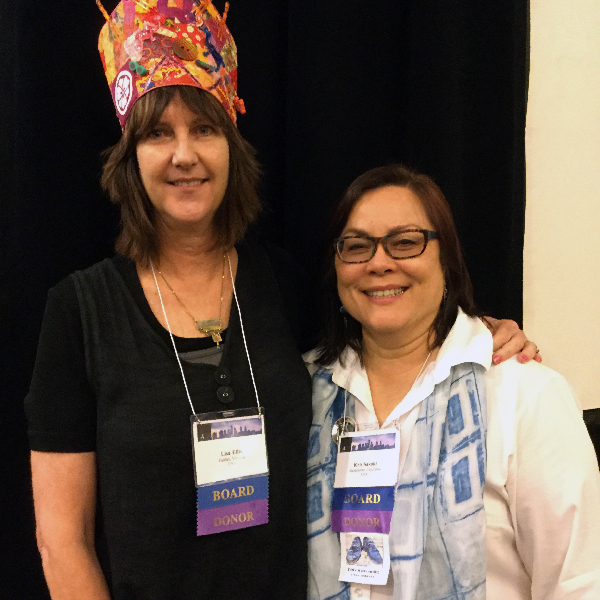 I am wearing the crown given to Kris by Yvonne Porcella at our organization's twenty fifth anniversary. This crown was made by Darcy Falk for Yvonne's Silver Star in 1998 at the International Quilt Festival in Houston. I will be teaching at the International Quilt Festival in Houston, November 3-November 6, 2016. I hope you will look for me! You can find me at the Friday, Sampler Forum, Healing Quilts in Medicine lecture on Saturday afternoon and my Graceful Trees workshop on Sunday morning. I look forward to seeing you in Houston! 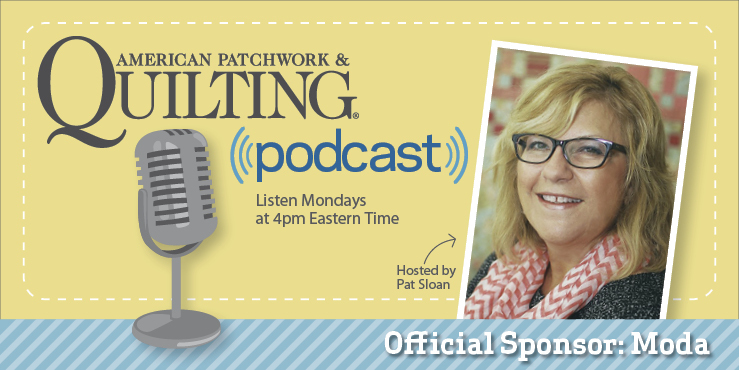 On October 5, 2015 I was on Pat Sloan's American Quilting Radio. Click here to hear the show. 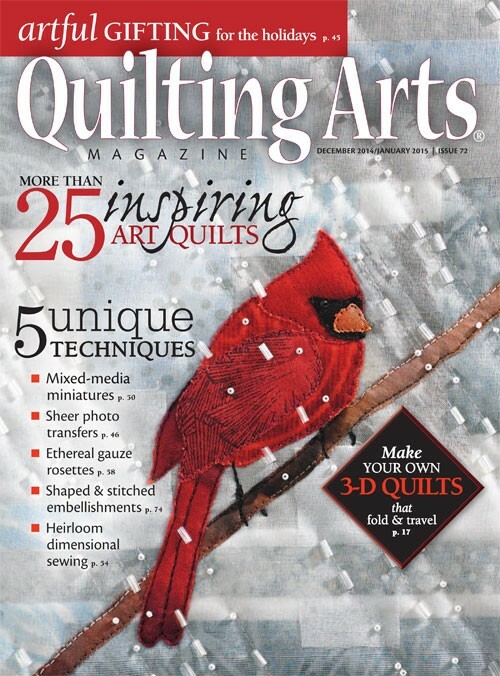 The December 2014/ January 2015 issue of Quilting Arts published my article about our Healing Quilts in Medicine projects. Inluded was a gallery of the Bone Marrow Transplant Unit and Viewing Room at the Univeristy of Michigan. 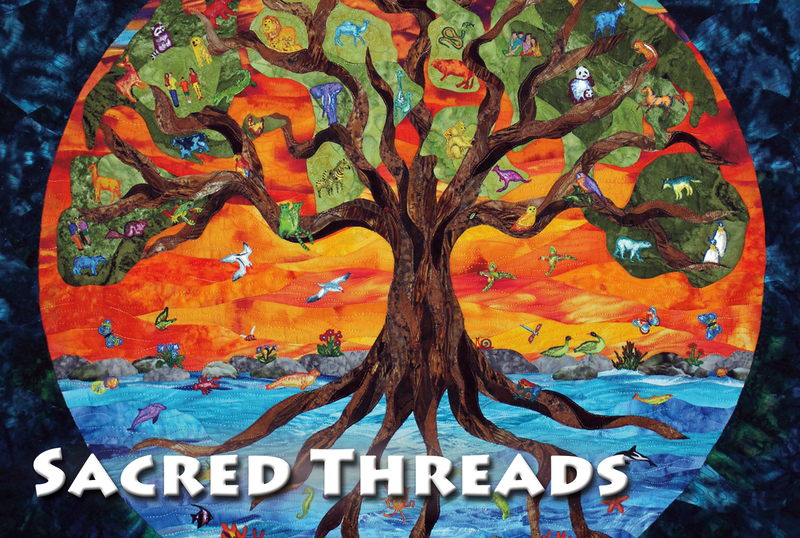 Sacred Threads 2015 is coming this July! The dates are July 10 - 26, 2015. The call for entries for the main exhibit has now ended and the work is incredible. You do not want to miss seeing this amazing exhibit of our most poignant pieces. For more information and to see gallery images, go to the Sacred Threads website or contact me at lisa@ellisquilts.com. Mary Kerr's has included my work in two of her recent books. 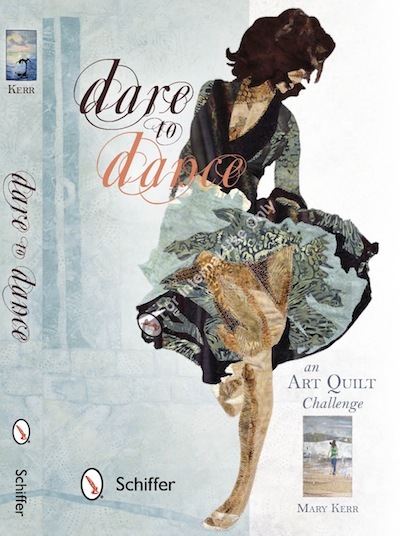 Cutting Edge Art Quilts and Dare to Dance. These are beautiful coffee table books and make wonderful gifts. You can purchase these books directly from Mary Kerr. Here is the link to her webpage. Our Healing Quilts in Medicine exhibit commissioned by the National Institutes of Health traveled to International Quilt Fesitcal in Chigaco, Long Beach and Houston. Twenty one pieces, based on the plants and animals used to make cancer treatments were featured. Go to gallery.